1. Bring a large pan of salted water to the boil. Simmer the potatoes for 12-14 minutes until tender, drain and set aside. Meanwhile, mix the oil, garlic and lemon zest and rub all over the lamb steaks. Season. 2. Heat a large frying pan over a medium-high heat. Fry the lamb for 3-4 minutes on each side. Lift out and set aside covered with a sheet of foil. Toss the potatoes into the hot frying pan and fry for 2 minutes, stirring, until just coloured; season and take off the heat. Set aside. 3. Meanwhile, in a small pan, heat the butter to foaming, add the shallot and a pinch of salt; sauté for 5 minutes until soft. Add the peas and 1 tbsp water and cook for 3-4 minutes until piping hot. Take off the heat, crush with a masher, stir in the herbs, most of the feta and the lemon juice. 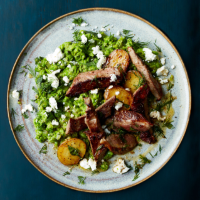 Pile the potatoes, peas and lamb onto plates and scatter with the remaining feta. Add the lemon juice to the peas only at the last minute; otherwise it can dull their bright green colour. This recipe appeared within the February 2018 recipe card collection.